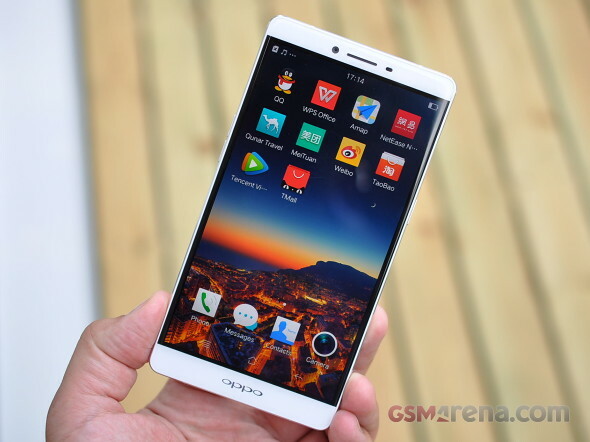 The Oppo R7 Plus is the larger of the two models announced today, and despite the identical chipset and RAM, there are plenty of differences that set it apart. Obviously, the 6-inch display is the most readily noticeable upgrade, but the higher screen-to-body ratio means that the smartphone is not all that much larger than the R7 as the jump from 5 to 6 inches would suggest. At 158 x 82 x 7.8 mm it's more or less the same size as the 6-inch Huawei Ascend Mate7, and a tenth of a millimeter shorter than the 5.5-inch iPhone 6 Plus. The R7 Plus is, however, quite heavy at 203g, a good 10% more than the Mate7. The design language is similar on the two Oppo models, with the finely crafted all metal unibody looking stylish and classy. 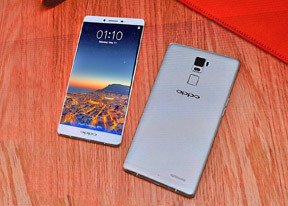 Oppo is keen to point out that the magnesium-aluminum alloy body has undergone 48 polishing processes, and while we weren't there to count them, the device sure feels premium to hold. Interestingly, the position of the power button and the volume rocker is mirrored on the Plus model, compared to the regular R7. Additionally, the R7 Plus comes with on-screen buttons, as opposed to the capacitive ones in the R7's bottom bezel, thus keeping the device relatively compact for the screen diagonal. The 6-inch display uses an AMOLED panel of 1,080 x 1,920 pixel resolution. The highlight here is the edge-to-edge feature, though it's less impressive than we expected. While it does look the part with the display off, firing it up reveals a pitch-black frame surrounding the lit area - the bezels are there, only they're underneath the 2.5D curved glass. Moving on to more practical considerations, the display is protected by Gorilla Glass 3. It's still reasonably sharp, though the 367ppi density is nothing spectacular by today's standards. Owing to the inherent qualities of the AMOLED tech, the panel provides great contrast and viewing angles. Colors are vivid and it's quite bright as well. We took the device outside to see how it fares in the sunlight and we have nothing but praise for it at this point. The Oppo R7 Plus comes with a fingerprint sensor on the back, much like the one on the Mate7. Located below the camera module, it's in a natural position for access with your index finger. There's a multitude of camera features too. The R7 Plus comes with a 13MP ISOCELL RGBW sensor, unlike the conventional RGB imager found in the R7. Oppo claims that the sensor outputs images with 78% less noise and can pick up 32% more light, though we haven't been able to verify how it performs just yet. On top of the phase detection autofocus in the R7, the Plus model also brings laser autofocus as well. A dual-LED flash is another improvement over the single-LED unit of the R7. Like its smaller sibling, the Oppo R7 Plus boots the company's latest ColorOS v2.1, which is based on Android 5.1. It runs fluently on the Snapdragon 615 and the 3GB of RAM provide ample room for multitasking.